In the army, they knew him as ‘Bull’ Kumar, awed as his mates were by the strength of his thick, muscular neck. Col Narendra Kumar earned this sobriquet at the National Defence Academy, then in Dehradun, during the first boxing match he fought. His rival was a senior cadet, S.F. Rodrigues, who went on to become the chief of army staff. Col Kumar lost the bout, but the ‘Bull’ epithet stuck. 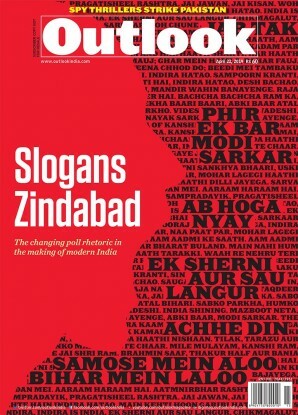 Since then, Col Kumar has done everything in his long military career to justify the name his colleagues gave him. Like the bull, he loves a challenge, sniffs it even before others can see it, and goes at it in a single-minded pursuit, indifferent to consequences, full tilt, tail up. It was these qualities of his that ensured the Siachen glacier became an integral part of India. Bound to each other by thick ropes, trekking across the harsh terrain for weeks on end, Col Kumar became the first Indian to climb the Sia Kangri peak, which offers a majestic view of the Siachen glacier. But there was also a surprise awaiting the team—a Japanese mountain expedition facilitated by the Pakistan military had a presence there. After a “sit-rep” (situational report) was dispatched to the army headquarters, the team went from peak to peak, staying ahead of snow avalanches to chart the area. 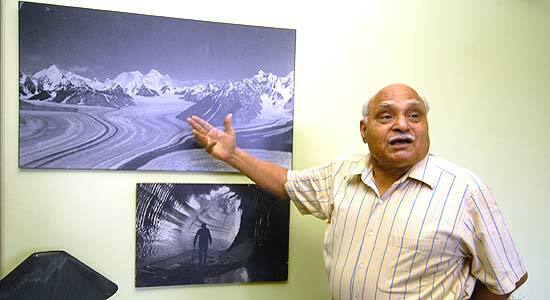 Bull Kumar led other expeditions till 1984, losing four toes to frostbite. His sacrifice wasn’t to go waste. Cut to 1984: intelligence information convinced the army headquarters that the Pakistanis were planning to militarily occupy Siachen and the heights of the nearby Saltoro ridge. There was evidence: in the autumn of 1983, a team from the Indian army’s elite Ladakh Scouts had sighted a Pakistani special forces unit from the ssg in the Siachen area. This prompted the area army headquarters to immediately draw up plans for a major operation in the summer of 1984. The fourth battalion of the Kumaon Regiment was assembled and equipped for Operation Meghdoot, which had as its bulwark Kumar’s maps, films and his knowledge of the area. On April 13, 1984, Operation Meghdoot finally got under way. Air force choppers, their engines clattering in protest at being pushed to the limits of technological possibility at incredible heights, began to drop soldiers at Bilafond La which is today part of the Siachen Base Camp. For the first time in history, India had stamped its claim on the Siachen glacier. The sturdy Kumaonis then trekked up the glacier to secure the two major passes—the Sia La and Gyong La—even as the Pakistanis were scrambling their troops into the region. The Kumaonis moved up the Saltoro ridge, overlooking the approach from Pakistan-occupied Kashmir, and Sia Kangri to establish posts that would give India the command of the glacier. With hands veritably frozen around their 7.62 mm rifles, Indian troops battled the elements to establish a military foothold in what would become the world’s highest battlefield. “At times, you face impossible choices on the glacier. We always moved in pairs, bound to each other by rope. At one point, my buddy fell into a crevasse. For 45 minutes, I grappled with the idea of dying with him or cutting him loose and saving my life or to hang with him till the cold killed us both. I am glad that I never cut the rope.” In those 45 minutes, the buddy crawled up, the duo living to continue their foray from peak to peak. To the west of the glacier were hostile Pakistani troops; on the east and to the north stood the Chinese. 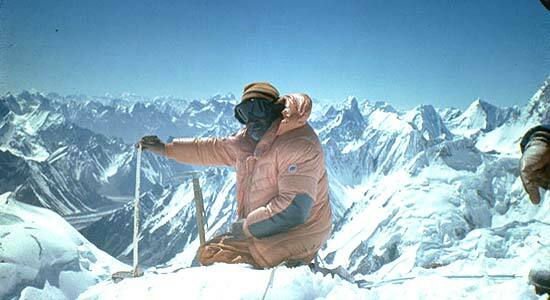 Had Col Kumar been given a clearance, he’d perhaps have climbed the K2 peak in the Karakoram ranges as well. But to reach K2, he’d have had to traverse the Shaksgam valley, which the Pakistanis had illegally ceded to China. 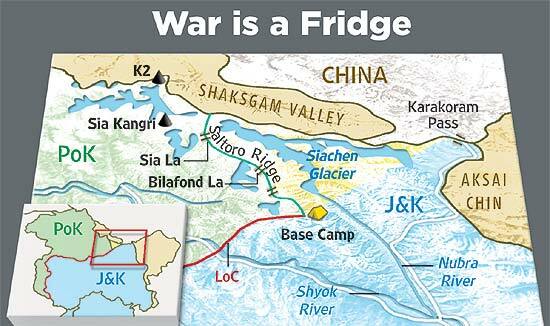 So, India halted its advance on reaching the northernmost tip of the Siachen glacier, settling in on its frozen waste. As Indian troops established more posts, a key base on the glacier was named Kumar Base: perhaps the only living Indian army officer to enjoy this singular honour. India’s claim to Siachen was confirmed. But the “refrigerated combat” against the elements and Pakistan had only just begun.